This one is the same sketch as the previous post’s card, I just used a different selection of Prima Anna Marie paper and chipboard. 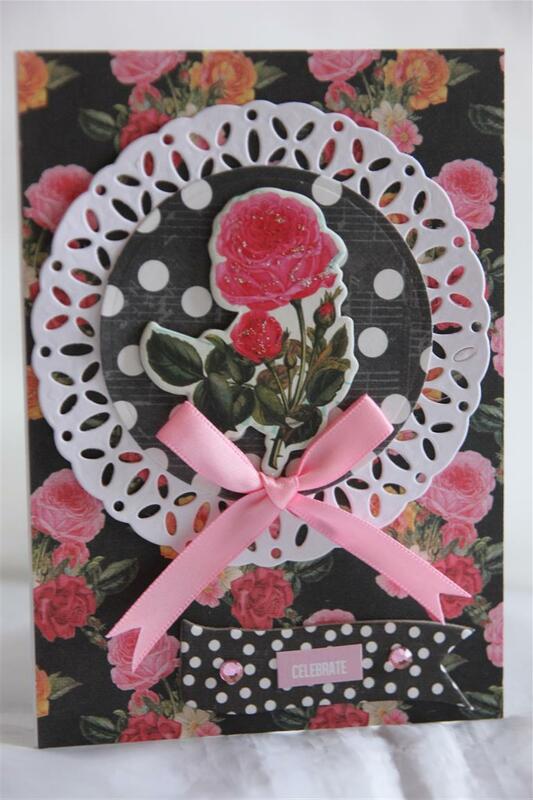 The circle was die cut with spellbinders delightful circls die, and I added a pink ribbon. 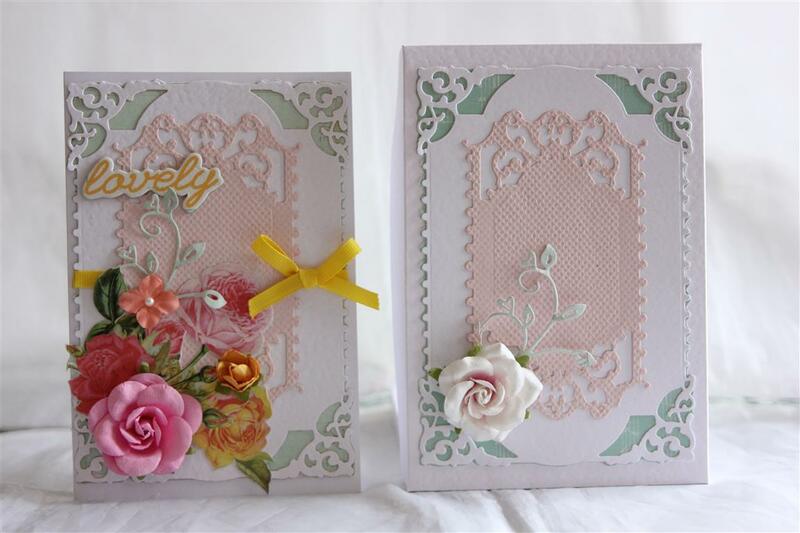 This week has flown, friday tomorrow, that means the weekend is nearly here, and I can’t wait to do some card making – it seems like ages since I sat down for a serious session in the craft room! til tomorrow…. When I had the Anna marie paper out to make my box ( last nights post) I made a quick couple of cards with it, and this is one of them – so, anna marie patterned paper, a cirle die and fancy cirle using spellbinders Delightful circle, and some ribbon, chipboard and flower.quick post tonight as tea is cooking! Til tomorrow….. 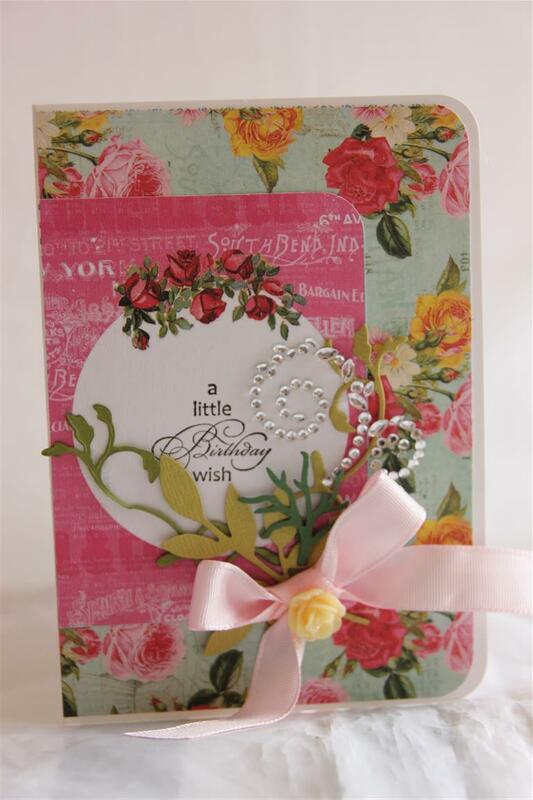 Here is another box and matching card using Prima Anna Marie paper and some prima flowers. The die cuts were made with spellbinders Enchanted Labels 28, and I just added a ribbon bow, and chipboard piece ( also from prima).Once I had die cut the large rectangle I stuck it onto a piece of patterned paper and fussy cut around it to get the different colour underneath.The flourish is by magnolia. I taught a lovely class of ladies this morning, then headed to the shops to replenish my cupboards, as I haven’t had time to shop since we got home from holidays. As usual my break has gone far too quickly and it’s back to work tomorow!Til tomorrow…. 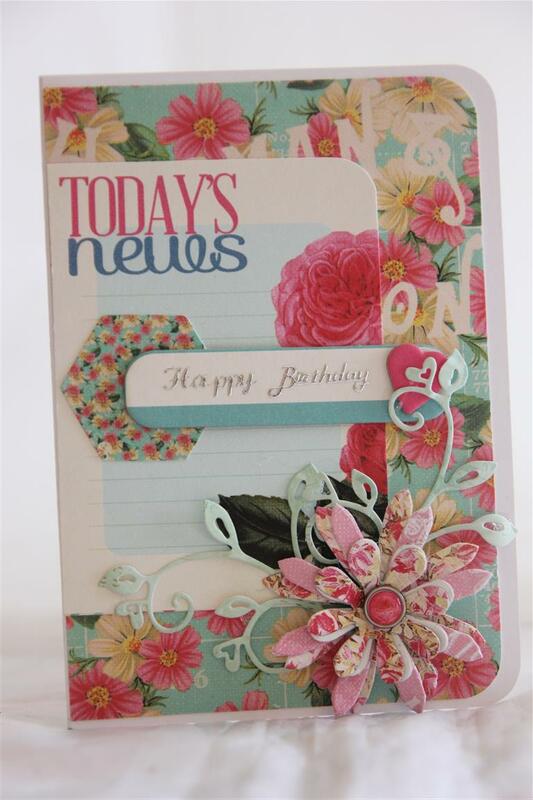 here is a familiar card layout for all of you that follow my blog – it is a favourite of mine. 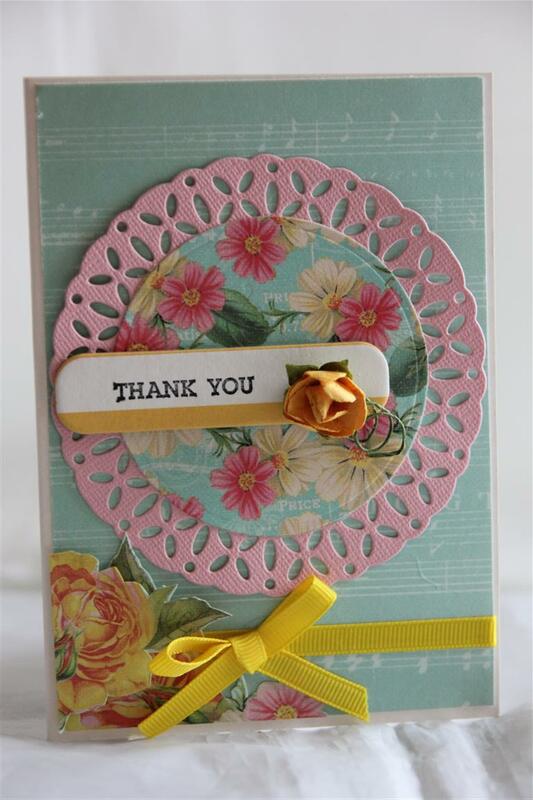 I have used prima Anna Marie paper,chipboard and brad, and rounded all my corners with a corner rounder. The flower is die cut with stampin up sizzix blossom party die, and the flourish is a magnolia dohickey.A simple layered card tonight! I have been in the craft room for a short while this afternoon, stamping out some mens cards,but I really don’t seem to be achieving very much!Oh well – it’s relaxing and that is the main thing! til tomorrow…. This is the final card in my Prima Anna Marie series. I used the papers along with one of the matching tags ( which I stamped with a stampin up sentiment stamp) a piece of the chipboard and I fussy cut some of the flowers from another piece of the paper, and layered them up on the side.tomorrow christmas cards! Til tomorrow…. 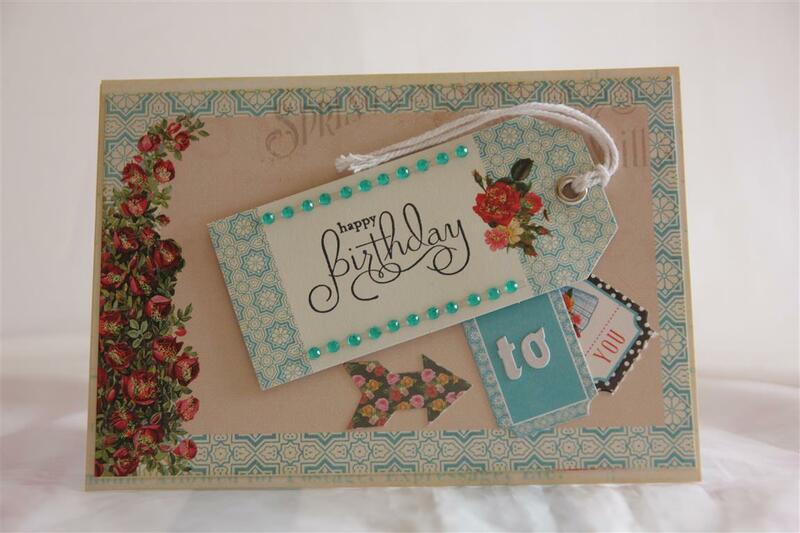 Prima Anna marie paper, tags and stickers, with some bling strips and a stampin Up sentiment. What I like about this paper is that it is all all different but co-ordinates perfectly.Each of the cards so far look so different but the colours all fit together. one more in this group, and then we will return to some christmas cards! til tomorrow…. 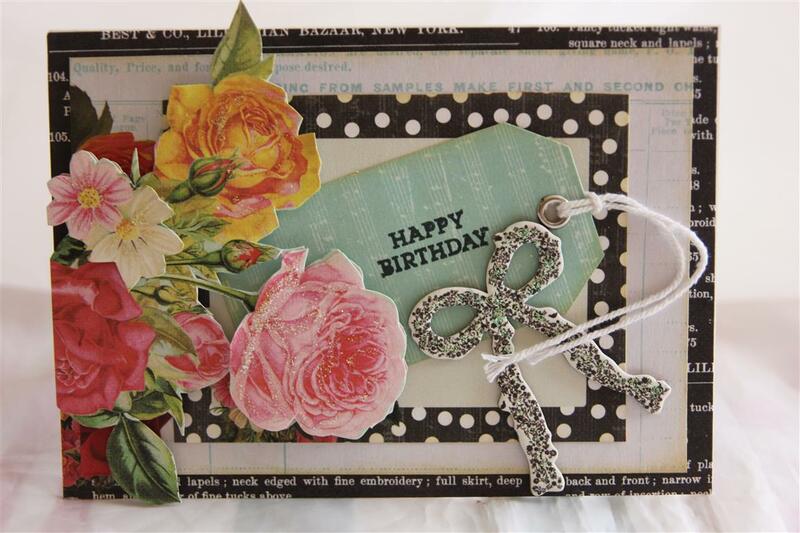 Another favourite sketch with this card – prima Anna marie paper,and a lovely big ribbon bow, resin flower, prima bling and an assortment of leaf punches and dies. I rounded the right hand corners on all layers. a lesson taught today, and more lesson prep this afternoon. Back to work tomorrow, if my voice holds out! Til tomorrow….